MINDZPEAK: An Indian journey ! I have always wondered how efficient can a whole system get regarding arrival delays. Our railways has maintained its efficiency in many aspects. So to say, the train arrival delays, the incorrect info from the enquiry department regarding those delays, etc. I mean to say, such efficiency really wakes you up from a probable lazy and relaxed Sunday which you have planned all week. Which reminds me of a day when I earned the experiences of traveling in India the hard way. I'm talking of December 2008 when me and my friend Yogendra traveled to Kolkata to attend the wedding of our friend Abhijeet. The journey we had was once in a lifetime type of things. Maybe that's everyday stuff for other people. But it worked me up to such an extent, that I had to share it with my friends through email as soon as I returned. Or, rather, as soon as I was in a condition to write. But all the same, it was a journey to remember. Yogendra and I joined their family from Kanpur to Howrah and our return tickets were booked for Tuesday (9th) by 'Rajdhani Express'. But Yogendra had to attend an important family wedding here on 8th so we decided to return on 7th. No tickets were available on the 7th to Kanpur. However, we got two 'Tatkal' ones in one 'Chambal Express' which left Howrah at 5:40 pm. The only problem being that this train would take us only till Allahabad before turning to Gwalior. "Chombol Exhpress to bohut aachhchhaa haai. Homesha on time hota hoi. Baaki to phir kismot hoi. Lekin homara kismot ka dekho to aachhchhaa hoi... !!" And I left him with his 32-denture smile on what you could actually term as high on confidence. Things didn’t start off that great as both of us bought almost the same eatables without knowing what the other had already bought. But in about the first hour or so, we felt relieved looking at the speed of the train. It seemed as if the driver had some wedding to attend that very night too.... He probably was giving the throttle, all he had got. But we had nothing to complain. The train was reaching before time at all stations. I can't remember clearly what actually woke me up. It could have been some discussion about the state of Indian Railways between Yogendra and someone who sounded like an aged Bengali uncle on the lower birth. I should have mentioned before, that we were in the 'sleeper' coach and not in AC, but I don't think that would be necessary now as you must have already made out. So, on descending down, I was greeted with the news that was to frame the events for the day. A goods train was ahead ours in the same direction when suddenly something must have got into the driver, telling him that THIS WAS THE DAY... !! So, he managed to take his train onto the track where another goods train was parked in peace. To make it simple, some of the coaches jumped over each other onto the standing train. And when they were done with that, they fell onto the adjoining track, pulling apart the rails. And to make the matters a bit more complicated, they took along with them, the overhead power cables. This happened a bit before Mirzapur station which wouldn't have been much of a problem had we reached Mirzapur. But the crux of the matter was, we hadn't. To round it all up,.... pretty thick.... !! We jumped out onto the platform. When I say jumped, I mean jumped as this was one of those stations you pass by, usually, when on some train. I guess they had just cleared some land to lay the tracks and elevated the rest to serve as the platform. Complete with mud, stones, grass and all. But you would be mistaken if you didn't consider it as a proper station. 'Pahara' as it was written on the small building had its own station master right on duty in his black coat, a tie which I can swear had a knot (irrespective of what others said), a white (maybe off-white) pair of pyjamas and slippers. As we got down again, we saw a Sardarji and his family coming down from the AC coach with their bag and baggage. He was on his phone, telling someone to send a car to Mirzapur. It was only after some bystander suggested to him that cars run on any roads, and the car could be brought even there to ‘Pahara’ that he got the idea and changed his orders. And then they began climbing the foot-over-bridge (yes, this station actually had a foot-over-bridge) to get to the other side. We joined the small crowd gathered near the engine of our train where the driver, smoking his 'bidi', was answering the queries in a unbelievably relaxed way. That was when I felt sure that this was going to be SOME DAY... !! Well, in a few minutes, a diesel engine came out of nowhere and took its position at the back end of the train. We got up inside. It started pushing the train forwards. And we saw the Sardar family who had just got off the bridge on the other platform ran back up, thinking that the train was moving. But the diesel engine then pulled the train back on the side loop on the far side of the other platform. The Sardars were in the center of the bridge. They must have thought of jumping right down as a good option. But even if they did, they didn't take it. By now, the few shops outside the station had begun to send in their supplies at some renewed costs. It was the one day when I felt happy listening to a tea vendor selling tea at Rs. 6 for a small cup. At last my hatred for tea had come to some use. Guavas were at Rs. 15 a couple. Then we got the news that the train would be taken back to a station to be diverted to Banaras (Varanasi) to reach Allahabad. And before soon, it actually started moving. But as we reached 'Dugmugpur', another of those stations about 4-5 kms back, it stopped. And when it got above 40 minutes, we again jumped down, only to find the diesel engine detached and going back towards 'Pahara' on another track. The driver of our engine was still there. And we could make out that he wouldn't be for long as he had to give in his application for leave on Eid at Allahabad which was now no more a possibility. He looked so irritated, I wouldn't be too wrong if he was thinking about running his train full speed forward no matter what. He actually could have, but for the lack of power in the electric cables, he couldn't. And then we came to know that our train would be taken to Mughal Sarai to be diverted to Allahabad. That made 2+2.5+2.5 = 7 hours to Allahabad, which wasn't the best option if we wanted to board 'Sangam Express' to Kanpur which departed at 6 pm, as it was already 12 noon. So, we picked the luggage (which wasn’t very light considering the suits and winter wear we had with us) and jumped off onto the tracks. And we hadn’t gone far when I saw the same Bengali uncle sitting on a broken tree trunk. He was probably mulling over the fact that his ‘kismot’ had finally ran out on him. So, we trotted along the village road. If you could actually call that a road. After sometime, we got to a proper road. Supposedly the highway to Mirzapur, as the milestone said. We waited, and waited, and waited, etc. And then, to our great relief, along came an auto. But relief wasn’t a word made for days like these. This auto could have been like those we have in Delhi. Or like the tempos we have in Kanpur. It was neither. But surely inspired from the two. And after we squeezed ourselves among the fourteen and a half occupants of that vehicle, it was an adventure ride. The trip was more or less un-eventful passing through countless villages, picking up more passengers on the route, and an odd heated dialogue as one old man got down to buy some jalebis while the others paid the fare. And also the way we managed past the massive 'Mela' in between which takes place one day each year. Of course, this was THE DAY. And we reached Mirazapur bus station. I haven't seen many bus stations which are that huge. I don't think that it was the fact that there were only two buses in that bus station that made it look huge. I have seen many which have no buses at all, but I never called them huge. But that's not what's of importance. Of the two buses which stood side by side, one looked impressive. That was one of those 'Deluxe' ones that are known to be very efficient. But then I paid a bit more attention to the details. And then I saw its door. It was an absolutely normal looking door. But the only problem was, if it was anything moving across the frame of that door, it had to be outwards. There seemed no way possible in which you could try to push in any thing inside through that. In the present circumstances, that is. This fact did help us to think about trying the other bus. Well, if you would call it a bus, you wouldn't be too wrong. It was a bus alright. But one of those half-sized ones, which, if you happen to see on a normal day, you would feel pity for its passengers and maybe even pray for them. But,...., as I have warned before, this wasn't a normal day. As we got seated, we asked one uncleji behind us about the time it would take to reach Allahabad. (it is 88 kms from Mirzapur as we had seen on a sign) And he confidently answered it to be somewhere between 2-3 hours if we moved non-stop. And no sooner than he had spoken those words, his wife interrupted what would have been more information from him. She looked at him as if he had cheated someone and she was feeling the burden of the guilt and corrected him by telling that the time would be about 5 hours. We joked between ourselves about Auntiji's calculations and imagined it would be quicker if we went on foot if her info was to be believed. But soon we got to know that husbands don't always have the correct info. And also what was actually meant by the word 'non-stop'. The driver of our bus made it to appear as if this was the picnic trip he had been planning all his life. He looked back and talked more than he looked forward while driving. We stopped thrice on demands from the conductor because of some passengers being unsatisfied with the fare. Well, I stopped counting after three, partly because sleep was conquering me and partly because I couldn't make out anything that was in progress around the far end of the bus, because of the number of people stuffing the passage. But yes, he once stopped for a dose of tobacco, once for an extended snack and once because maybe he just felt like that was the best thing to please himself. I think there should be a law regarding the standardization of the make and design of rickshaws throughout India. Maybe the rickshaws in Allahabad are not meant to be used for travel. We didn't know. But the truth was, we had got on. So, it was too late. I think the lone bright point in the day was when we found the train still standing at the station. We quickly got our tickets and got into a coach already brimming with occupants who were either 'staff' or some close acquaintance of the station master. I'm skipping the bit about the hooligans who got in at some station and also a couple of drunk policemen. I don't want to risk my night's sleep remembering those. The train strangely pulled into platform no. 1 at Kanpur, so that it was easy to get an auto to home. I say easy if you can manage to get them a bit near your side of the deal. But at last we got one. No matter we had to walk out of the premises. But we got one. But did we forget something ??? 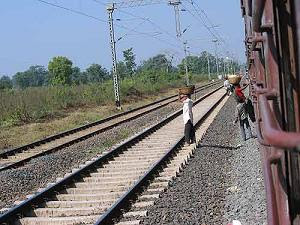 Well yes, I forgot the one message for the world which I have always had in my mind, which goes as.... "Never get anywhere even close to the 'Allahabad crossing' when it’s the time for all the ‘Rajdhani Express’ trains to pass.... "
So we waited, and waited, and waited, etc. Well, I have always been fond of watching moving trains. But this was different. But I kept myself busy for that hour or so by counting the number of coaches on each passing train. Just the type of thing that would keep a child busy. But it does work. 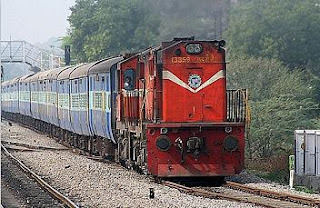 So, I watched 'Ranchi', 'Sealdah', 'Kolkata', and 'Patna Rajdhani' trains pass by in that very order. 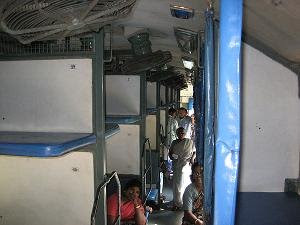 I was on the count of 7 of the coaches of 'Bhubaneshwar Rajdhani', when I was interrupted. It was the driver of the auto we had boarded, who was talking in a peculiar tone on his cell phone. Well, I’m not one to be disturbed by the talks of an auto-driver on his phone. But what actually made me lose my count was the announcement from this very bloke that we had to de-board. He conveyed to us, in no uncertain terms, that it wouldn’t be possible for him to go on further. Which quickly led me to analyze that we were an auto short. Though it didn’t require much of an analysis, but the day’s proceedings had left us in such a condition, that we automatically analyzed every new situation that would stare us in the face. Maybe the guy’s friends had managed to get together and planned to have a great time which he couldn’t afford to miss. Or maybe, his wife had called to tell him that she had finally decided to leave him for good to be with the taxi driver. I couldn’t exactly say. For, I didn’t know the man or about his life. But whatever it was, it meant that we were on foot once again. I guess even our bad luck had run out on us. Maybe God had some mercy on us finally and we found another auto which we boarded. Mom was quick to bombard me with her never ending questions when I entered home. But I had only one answer for all of them. I just smiled. Someday for sure! That pic... of the 'human pyramid on bus'... where's that taken at? Btw, I got my own custom navigation bar working! :-D Chk it out... in firefox mozilla though, 'coz IE is not working anywhere at the moment! Some widgets are giving prb I think. 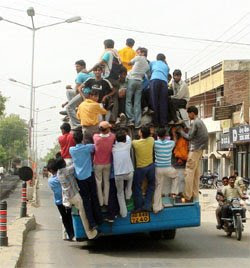 The pyramid on the bus is an everyday sight in most small towns in UP. Even in some bigger ones. The custom navigation bar you got looks cool. But where did the lighthouse go... ?? BTW .I have missed trains twice ..once coz it left on time ..another time it left before time ..n some others were left out too..
hey dude, I did my undergrad in allahabaad. Prayagraj to dilli has never been late cos the netas always travelled on that.There is a train to chennai from banaras reaching allahabad at 9 PM. We left the hostel to reach station at 12 pm.We did this for 4 years and innumerable times. That train has always managed to come between midnight and 2 am. Who said Indian railways is not on time?